Ascot Racecourse is synonymous with quality, excellence and a truly memorable day out. The highlight of the year is Royal Ascot in June with five days of tradition, pageantry and style. Outside of Royal Ascot spectacular racing takes place throughout the year, each raceday offering a unique theme and atmosphere including a summer cocktail party in July, a '80s concert in August, Beer Festival in September and Fireworks in October as well as five dedicated family racedays and much more. Looking back over the 300 years since the track was founded by Queen Anne, Ascot Racecourse will be proudly celebrating its tercentenary in 2011. In this uniquely historic year, racegoers are invited to enjoy the racecourse's anniversary, when it will be showcasing not only its heritage and royal connections, but also the reflection of society, and fashion through the centuries, and significantly some of the most memorable racing ever seen. Royal Ascot is a national institution and the centrepiece of the British social calendar. From the 14th to 18th June tradition, pageantry, fashion and style combine at one of the most beautiful settings in the country. 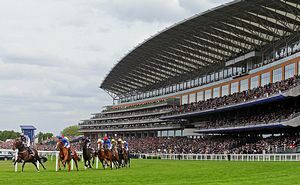 The quality of the racing at Royal Ascot is simply outstanding, with £4 million in prize money on offer and a total of eighteen 'Group' races (racing's term for the most prestigious races) over the five days. As well as being home to the very best flat racing action, Ascot also stages five days of breathtaking jump racing from October to December. The jump season at Ascot features some of the most important races in the calendar, in particular, the racing held on Saturday 19th November. So, put your winter coat on and travel down to Ascot for a great day out. Adjoining Windsor Great Park within easy reach of the M25, M4 and M3 motorways. Approximately 45 minutes drive or train journey from London, with regular services running from Waterloo, Guildford and Reading. There is a frequent service to Ascot from both Reading and London Waterloo. The average journey time is 28 minutes from Reading and 53 minutes from Waterloo. Regular services also run from Guildford. The railway station is a seven-minute walk from the racecourse. For more details call National Rail Enquiries on 08457 48 49 50.